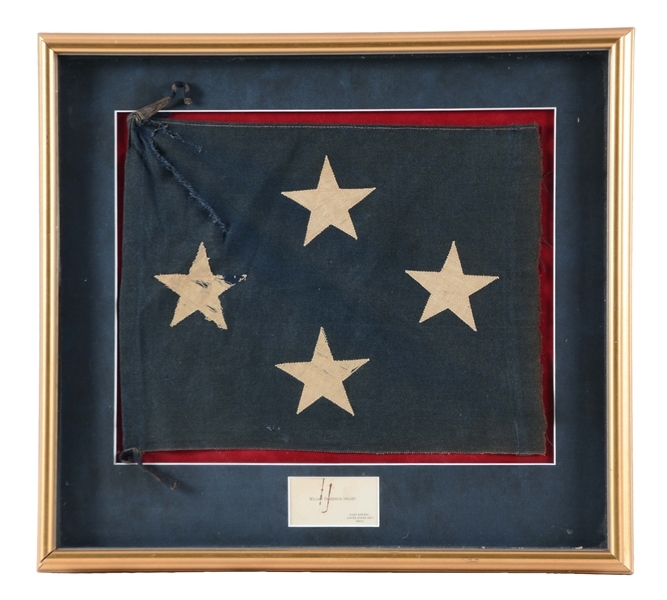 Lot Detail - WWII Admiral's Flag Used By Admiral William Halsey. WWII Admiral's Flag Used By Admiral William Halsey. Framed wool bunting flag measuring 11" by 14", with applied cotton stars and a pair of cotton ties at the heading. Framed with the flag is a calling card which reads "William Frederick Halsey/ Fleet Admiral/ United States Navy/ (RET)". Card exhibits a rust stain from a paperclip. Presumably the card was attached to the flag. Accompanying the flag is a letter dated February 5, 2003 attesting to the flag having been purchased from the estate of Admiral J.J. Ballentine. CONDITION: Flag exhibits a 5" diagonal repaired tear starting at the top of the heading, shows general wear and heavy wear to one star. From the Ray Bentley collection. Item Dimensions: 20 - 1/4" x 18 - 1/4" .